The Second National MACRA MIPS/APM Summit conference content is now available in a variety of formats. Online Archive of the Second National MACRA MIPS/APM Summit Presentations! Flash Drive of the Second National MACRA MIPS/APM Summit Presentations! WASHINGTON DC USA -- PAYMENT/DELIVERY SYSTEM REFORM UPDATE NEWS SERVICE -- OCTOBER 23, 2017: The Second National MACRA MIPS/APM Summit, www.MACRASummit.com, was held on October 11 - 13, 2017 at the Grand Hyatt in Washington, DC. The conference video content is now available for purchase in a variety of formats. Which Path to Follow: MIPS, CMS APMs or your own APM Model? The Politics of MACRA: Will There be Changes in the Future? Accountants: Approved for up to 14.75 hours of NASBA credits. Physicians: Approved for up to 14.75 hours of AMA PRA Category 1 Credits. The MACRA Summit is now offering a limited number of partial and full Tuition Scholarships to qualifying representatives of local, state and federal government, consumer advocate organizations, safety net providers, academics, students and health services research organizations. The 2016 MACRA MIPS/APM Summit conference content is now available in a variety of formats. 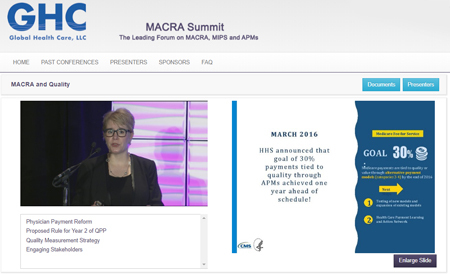 Online Archive of 2016 MACRA MIPS/APM Summit Presentations today! Flash Drive of 2016 MACRA MIPS/APM Summit Presentations today!